As presented in the Sport Congress 2018 thanks to a certain number of evidence-based researches and studies the IPCH Classification Committee has succeeded in proving the need of creating and using “half point classes” to better describe the functionality of each player and ensure a more fair and precise overall classification for Powerchair Hockey. The introduction of “half point classes” is to be considered only a refinement NOT a NEW SYSTEM because the basic criteria for evaluation and assessments have not changed, as well as the background logic and min impairment criteria which is still the same as the one approved in 2016. With “half point classes” Powerchair Hockey can count on 9 eligible classes all resulting from the formula: Arm Profile + Trunk Profile. Class 5 is the class of non-eligible players that cannot compete internationally in Powerchair Hockey. With this refined system, all players have now a functional and sport specific assessment aiming to measure how much the impairment(s) that results from a permanent and proved health situation is affecting his functionality in the core activities needed for playing Powerchair Hockey. This combined with the IPC principle that Classification has to be based on the impact of the impairment of the athlete and not on equipment, brings also IPCH to state that each and every player has to play in the Sport Class he was classified for according to his/her motoric profile. Every player is, of course, free to choose the equipment he prefers to use (t stick or hand stick) but this will not affect the sport class or his value in terms of points on the field. And so on for all the classes, regardless of equipment used. Considering those changes and considering the opinions of the Nation represented in Sport Congress and the opinions coming as well from the Classification Committee the Sport Executive Committee took the decision to raise the total number of point allowed to be on the field to 12. All rules and regulations will be updated accordingly and published soon. 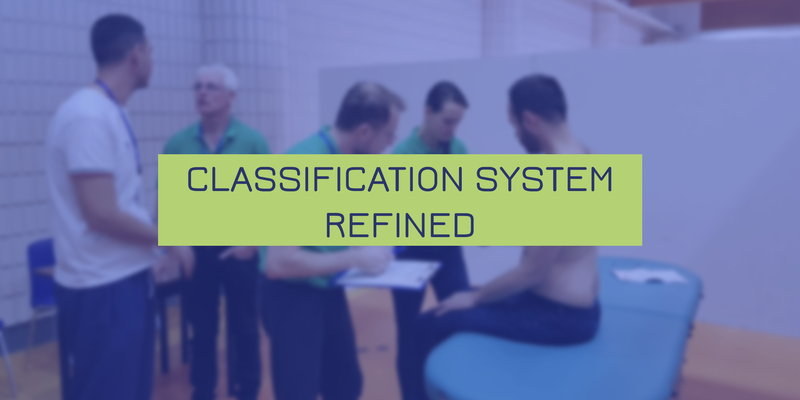 No Replies to "CLASSIFICATION SYSTEM REFINED"